Inspired Opinions Reviews - Legit or Scam? Inspired Opinions Reviews – Legit or Scam? 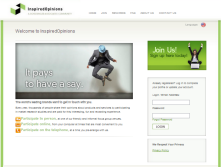 InspiredOpinions.com is the home of the market research website Inspired Opinions from Schlesinger Associates, a leading provider of market research opportunities for over 40 years. Market research is one of the oldest and most popular ways to earn extra money from home. It is free to participate in market research, and the only thing that is expected of you is that you give your honest opinion. In exchange for your time and effort, market research companies will reward you with either cash or rewards. Inspired Opinions lets their members join for free, then earn points as they compete their research opportunities. These points can then be exchanged for Amazon.com gift cards. In order to earn Opinion Rewards Points, you can participate in online surveys which will be emailed to you, or you can participate in person at opinion panels, or on telephone surveys. You can also earn points by participating in the online community created by Inspired Opinions. Creating a profile and keeping it updated, as well as participating in the activities they promote, will earn you extra points. One hundred opinion points have a value or $1, so one thousand points have a value of $10. Once you reach 1,000 points, you can redeem them for a $10 Amazon.com gift card, or continue to accumulate points until you collect more points to redeem for higher value cards. Filling out your profile as completely and honestly as possible is one of the best ways to improve your chances of being successful with online research. This allows the company to best match you with the survey or panel that fits you the best. If you do not feel out your profile appropriately, you can easily be disqualified from surveys you attempt to participate in, which would be a waste of your time and effort, and will earn you no points. Your points will never expire as long as you are an active member of the community, so remember to do surveys as often as you can, and to respond to them quickly. Some surveys are only looking for a particular sample size, and will close once they enough participants. Average Rating for " Inspired Opinions " is 2.43 out of 5 based on 7 reviews. Nearly three months ago I did an interview by Skype and cannot get paid. I have tried to contact corporate headquarters with no luck of speaking to a real person. I left a message with no response. I finally emailed the correct dept. it was reviewed and I was told I would receive a gift card (it was to be a check) in 7-10 business days.Still no payment. I should not have to beg to be paid after they used my time and knowledge. If necessary, I will take them to small claims court. They used to be a good company and now they are crooks. STAY AWAY FROM THESE PEOPLE! THEY DONT PAY THERE BILLS! After I answer preliminary survey, I got a phone call and offered interview/Study Survey at my home instead! The pay out is usually good for each market research study eligible to partcipate it. usually about $10 and up. Once I had to do a study on the fabric of a tee shirt in which I had to wear and wash it then take a short survey every week. I got a $100 visa giftcard. Sometimes it can be hard to qualify for a lot of the market research studies. I have earned my 1000 points and have been trying unsuccessfully to redeem them, I get no answers from customer support, I am beginning to think this site is a spam one. I am registered with the K Inspired Opinions. Take your comments and put them on Facebook. I had to do this with one company, and got a VERY quick response. They now ask for SSN's. Very scammy. Consumer beware! received two invitations to join focus groups in a year and it went well. The first one paid $150 and the second $75. They pay you on site as soon as the discussion ends. It is legitimate but you must meet the criteria they are looking for in order to be asked to sit in on a focus group. I am hoping to be contacted on a more regular basis. I've taken at least 100 surveys. I never seem to make it to the "final cut" of getting paid. I am thinking no one does since it seems as if after taking at least 100 I would have gotten one or two opportunities. I am thinking it is a way to get people's opinion without actually paying them. Post your comments on Facebook. I did for a survey site I was trying to deal with. Got a VERY quick response. They pay out all the time when you have enough points. The system doesn't always do it right away. Sometimes it takes a day or two or sometimes they are out of cards. Again within a few days they have more. I have contacted them and did get an auto reply message, but in 24 hours I also got a live person email explaining my question. Try this email if your still having an issue [email protected] I did a domain look up to get that email by the way. http://www.networksolutions.com/whois-search/inspiredopinions.com But I can assure you they are 100% legit. The only issue I can see is your out of the country. I have no clue if they ever service out of the US.